Marking has had some really bad press recently. Time and again, it is blamed for teachers' workload and also for being ineffective and a waste of time. 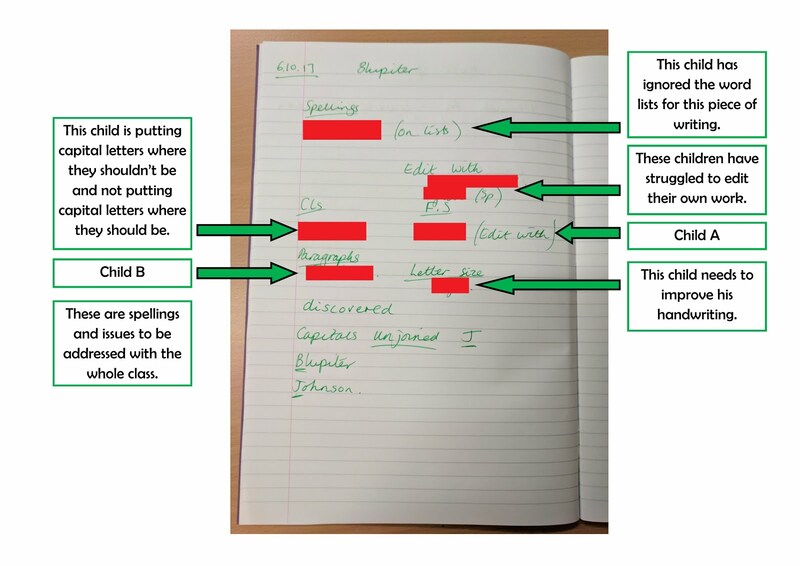 "No Marking" policies do their rounds on the education blog-sphere every now and then. 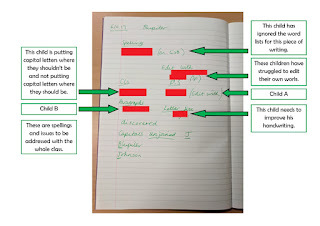 Whole-class feedback is a popular replacement for marking, with teachers often filling out a grid with information from pupils' books instead of writing in the books themselves. Despite this all being very persuasive and attractive, I still mark my pupils' books after every lesson. Our school has stripped our feedback policy of many marking statements but it still involves marking. 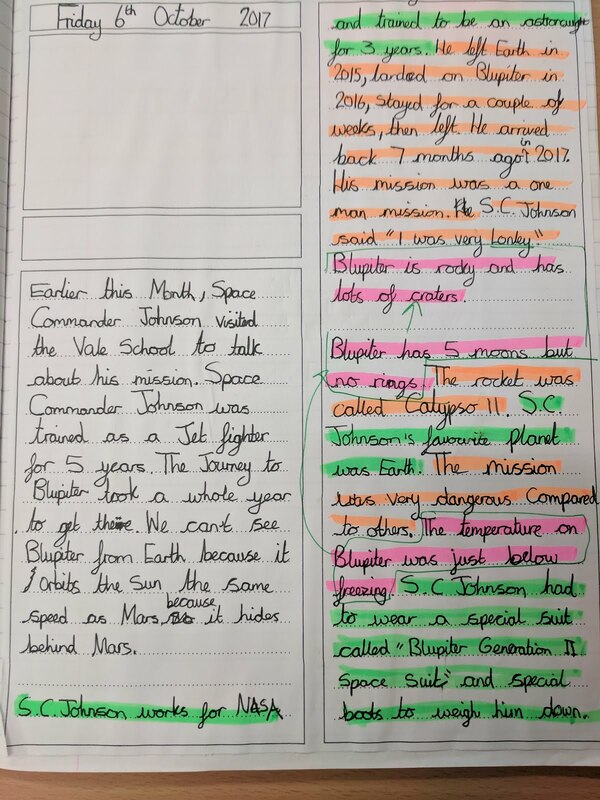 To see more about why marking is still worth doing, read the first half of this post by Chris Curtis. By "marking", I mean a recognition of the work the child has done and an indication that the book has been checked with at least a tick or use of my most-used stamper, Checked By Your Teacher. This helps pupils to be accountable for their work and encourages them to do their best as they know each piece will be seen by their teacher. If necessary, I will write more in a book - particularly to praise the child for something specific or to highlight or circle errors. 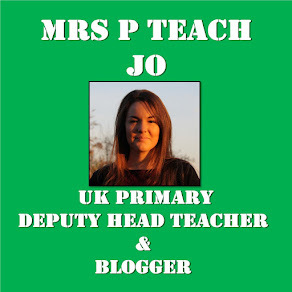 To find out more about how I mark quickly and effectively, see this blog post. 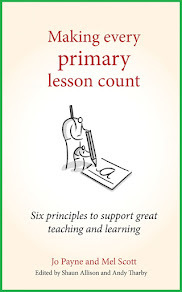 In our book for primary teachers, we write about how checking is more effective than extensive marking of pupils' books. We make it clear that recognition of the work completed is still important but that teachers can gain much from checking the work without necessarily writing anything on it. The checking of work can then inform planning for the next lesson. issues to address with the whole class including spelling/grammar issues, repeated misconceptions, presentation reminders. focus groups of children for intervention on a particular issue. conversations to have with individual pupils about a misconception or error. strong pieces of work to show to the class or to use as a model piece for the following year. a piece of work to look at as a class (I always ask for the child's permission to do this). My notes are probably complete nonsense to anyone who hasn't checked the books. Below you can see a page for an early piece of writing in which I'm gauging pupils' strengths and weaknesses, particularly in relation to their accuracy in basic writing skills (spelling, punctuation, paragraphing). In every child's book, I underlined 3-5 spellings for them to correct (this indicates to the child that I've read their work). Annotated page in my Notes & Scribbles book. Click image to enlarge. 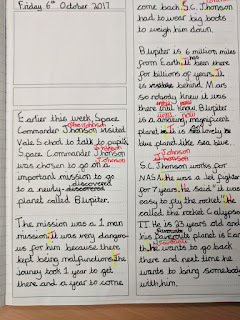 In the next lesson, while children are finding spelling corrections, editing their work or continuing their writing, I then set to, acting on the notes I took in the lesson. Child A has missed out many full stops. When I was first a teacher, I used to write "please add in full stops" or something to that effect when faced with such errors. However, missing full stops is often an indication that pupils struggle with sentence structure. 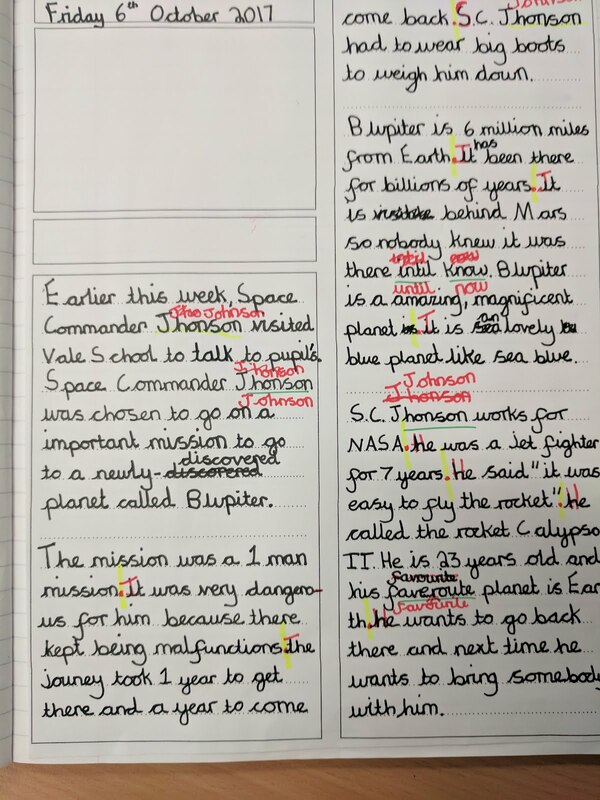 Therefore, rather than writing in this child's book for them to find where the full stops should be OR writing details about sentence structure at the end of their work, I spend a few minutes explaining sentences and then editing this work with the pupil. We sat together with a highlighter and went through the paragraphs, putting a yellow line where the end of a sentence came. Independently, the child then put in the appropriate full stops and capital letters; it wasn't how to put full stops that cause the misconception, it was why. Child A's work after our discussion. Red pen = child editing. Green pen = me. Highlighter = work done together. Child B has muddled her sentences in paragraphs. Rather than writing "your paragraphs are muddled" or "please sort your paragraphs" or giving a detailed description of her error and how to correct it, I spent a few minutes with her discussing paragraphs. She quickly realised where she went wrong and we used a highlighter to start sorting the sentences into appropriate paragraphs. 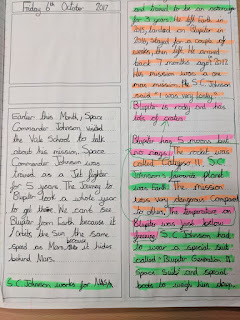 Independently, she continued highlighting and then rewrote the paragraphs. Child B's work after our discussion. Green - S.C. Johnson. Orange - the mission. Pink - the planet. In looking at my pupils' exercise books, there's no indication about my checking and its impact on the pupil's learning but, combined with my notes and scribbles and with a quick explanation, it's clear that checking the work made a big difference to some pupils' understanding of the basics of writing. Feedback isn't for someone scrutinising my books; it's entirely for the benefit of my pupils and I believe both checking and marking can have a part to play. Please Note: All work is used with parents' permission.